Though the Hui people are not defined by their Islamic faith, the vast majority of them are Muslim. This means they worship at mosques, follow priests known as imams, and worship the holy book called the Quran. Although throughout history many of their mosques have been destroyed due to religious persecution, since 1949 they have been allowed to build them and worship freely. All Hui communities will surround a mosque and the older mosques tend to be a mixture of Han Chinese and Central Asian architecture, while the newer ones are purely Central Asian in design. One of the finest examples is the Great Mosque in the city of Xi’an, which perfectly amalgamates elements of Chinese and Central Asian architecture. 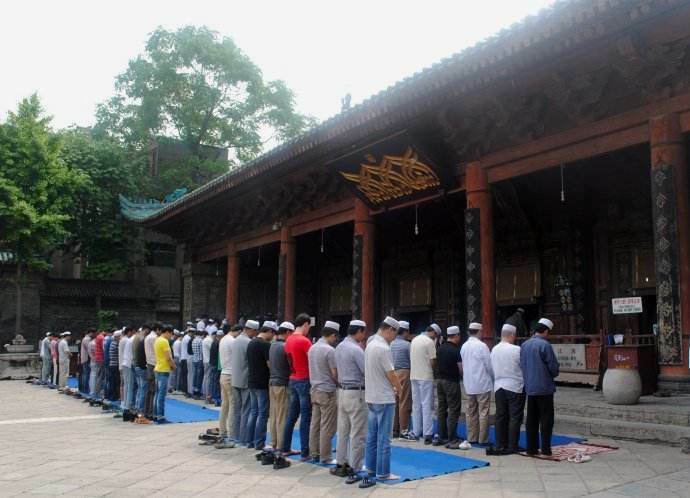 Some Hui people claim that Islam is the only religion through which Confucianism should be practised and thus accuse Buddhists and Taoists of heresy. However, other Hui people, particularly those who follow the Sunni Gedimu and Yihewani branches of Islam, burn incense during worship, which is thought to be the result of Taoist and Buddhist influences. Many of the other Islamic ethnic minorities, such as the Salar, regard this as a heathen ritual and denounce it. The Hui are the only Muslims in the world who are known to have female imams and, while male imams as known as ahung, female imams are known as nu ahung. They guide other women in prayer but are not allowed to lead prayers like regular imams.